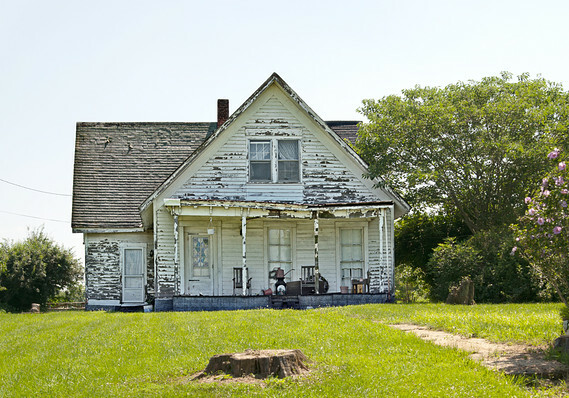 "If you think buying a fixer-upper house is an easy way to make money, read on..."
For some, buying fixer upper homes in need of some tender loving care or TLC seems like a good way to get into property ownership at a lower cost. The thought is buy the property at a good price, invest some time and money, add your personal touches and hopefully create some equity. This strategy can work for those with the required resources and experience (see 5 Big Mistakes below). And properly done, it can enhance other property values in a neighborhood and turn a nice profit. First of all, it is useful to understand that lending money is always about managing risk for the lender, risk that you'll pay them back as agreed and they don't have to seize the asset instead. As it relates to mortgage lending, lenders don't really want to foreclose a property because it takes time and effort to get the property back from the owner, list it for sale, then actually get it sold where they can finally get (some of) their money back. A good mortgage broker will help you understand your project and package your loan request in a fashion that minimizes risk for you and the lender. With fixer-upper properties, the risk is that you will run out of money before you complete the property, especially if you don't have enough skills and resources to see the project through, and that the lender will have difficulty selling the unfinished property. From a lender's point of view, there is also a big difference between financing renovations for profit (business / commercial application) and financing renovations for use (personal application), and the fixer upper mortgage lending terms are quite different, with financing for profit much harder. If you intend to buy a property, fix it up, and either live in it or rent it out (buy-renovate-hold), that's a straight forward mortgage and perfectly acceptable to a residential mortgage lender. Money is even available to help with the renovation costs. Down payment requirements will be as low as 5% if you plan to occupy and 20 to 25% if the property is to be a rental. If you intend to buy a property, fix it up, and then sell it for a profit (buy-renovate-sell, a.k.a. flipping houses), then mortgage lending gets a little tricker as do the tax considerations. Let's start with how mortgage lenders will view the two lending scenarios, and how they make money. Residential "A" lenders make their income based on a 'spread' between the interest rate that they charge you and their cost of funds (say interest paid on a GIC deposit) over the expected term of the mortgage. If that spread amounts to say $10/day profit for a typical 5 year mortgage, that's $18K to them. Conversely, if a flipper only intends to hold the mortgage for 4 months until they sell, $1200 profit is not worth the lender's time nor effort, not to mention the risk. Flipping is an activity with the sole purpose of generating income. While your flip might involve a residential property, a mortgage loan will be temporary at best and has nothing to do with 'residential use', that being to finance a home for the occupants. So low cost residential mortgage loan terms are not explicitly available for flipping. In fact, most mainstream "A" lenders don't want to talk with you if you are a flipper, and a private lender might be the only choice. Besides the financing distinction between renovating a property as a business (flipping) vs. keeping for residential use, there are significant tax considerations to understand in as well. Let's start with the Canadian Revenue Agency (CRA). They are pretty clear when it comes to determining how they are going to tax you. If the "original intention" of your strategy is to buy-renovate-sell, they view that as a business activity and assess income tax when you sell on your profit at your highest tax rate. If your original intention is to buy-renovate-hold, whether to occupy or keep as a rental property, then you should be able to get the more favourable capital gain tax treatment when you sell, which is about half as much tax associated with flipping. Sometimes borrowers get into project with the intent to hold, but things change and they decide to sell instead. To be sure this strategy might succeed on one or two, but if/when the CRA comes calling, your paper trail had better line up. Over the years, a number of borrowers have inquired about getting into a 3 or 5 year variable rate residential mortgage that allows them to break the mortgage early for only a 3 month interest penalty charge. "Penalty," you say - read on and compare! If flipping houses is your ongoing business (or regular evening and weekend hobby/job), at some point your lending options are going to shift you to commercial / private lending for your renovation mortgage where the profit you represent to the lender becomes much more apparent to you. Or you will need to find your own 'angel' investor and share profits with them. In this lending model, you will discover not only do you pay all the legal fees to put the mortgage in place, but also pay a "lender fee" and a "mortgage placement fee" (explicit or embedded in a higher interest rate). The higher rates and fees are all intended to make the lender's required profit and cover their costs over a much shorter lending term. At the end of your project, they want their money back, and you need to either sell or arrange "A" lending if you are going to keep. This is called the lender's "exit strategy." If the exit strategy appears unlikely or murky at best, no loan for you. Remember, they really don't want to have to foreclose. Flipper needs $300K up front in addition to their $100K down payment to acquire a property for $400K. In addition, the borrower needs 3 progress draws to fund the improvements (new roof, all new flooring, new windows and doors, new kitchen and bathrooms, etc.) totaling a further $150K, so $450K in total lending. Upon completion, the flipper's research indicates he should be able to sell the property for $625K, and get paid within 45 days, yielding a nice gross profit of $75K. Renovation is expected last 60 days, for a total hold or 'carry' of 105 days. In our example, it turns out that the best lender offer for $300K plus $150K draws is at 9% interest-only payments, 2% lender fee, 1% mortgage fee, plus legal costs including lien check at every progress advance. In our example, the $75K gross profit expectation is now reduced by $25K for financing (ouch), and a further amount for property taxes, insurance and utilities over the construction period (say $2K), costs to sell (say Realtor fees of 3% of sale price, $19K), yielding a profit before taxes of $29K. Recalling the tax consideration discussion above, the CRA is standing there with a hand out for as much as 50% of the remaining profit leaving you around $15K net profit for the project. Professional Flipping is not for Rookies. As you can see by the numbers, professional flipping and fixer-uppers are not for rookies. Besides the cost to finance, the controllable factors that really kill profit are unexpected cost overruns, longer than planned carry period (time to renovate and sell), and .... paying too much for the property in the first place! When you are seeking a mortgage related to a fixer-upper property, please use a mortgage professional who has 'been there, done that'. We can provide insights on your project, get you asking the right questions, plug you into tax advisors, and show you the best lending choices. Keep in mind that the more prime the location of the property, the better the lending choices will be. We can also help you understand other financing options such as joint ventures. Below, we have a section on Five Big Mistakes in Property Renovations. If you would like to contact us, we'd be happy to provide a no-obligation consultation on your project or objectives. If you like this information, please share it with your friends using the social sharing icons. Fixing up a house is expensive. Not to mention the acquisition costs and renovation costs (including overruns) , once you purchase a property the clock starts ticking and the bills start mounting. These are called holding or carry costs. If you plan to fix the house up and sell it for a profit, the sale price must exceed the combined cost of acquisition, the cost of holding the property, the cost of renovations, and the selling expenses. Even if you manage to overcome these hurdles, don't forget about income taxes, which could chip away at your profit further. The faster you can turn a project, the better. Renovating houses is a time consuming. It can take months to find and buy the right property. Once you own the house, you'll need to invest time to fix it up, including drawing up plans and getting permits, sourcing supplies and materials, countless trips to the hardware store and the dump. Inspections and rework, if not up to code. If you are planning on selling the property, that takes time and/or money to. If you show it to prospective buyers yourself, you'll spend plenty of time commuting to and from the property and meeting with potential buyers. Alternatively, Realtors will help you sell for a real estate commission. Don't forget to value your time. If it takes you 3 months full-time to manage the renovations, compare this to the money you can earn working for someone else. Maybe buying a "done" home makes more sense. The real money in buying a fixer-upper comes from sweat equity. If you have the time and are handy with a hammer, enjoy laying flooring, can hang and mud drywall, paint, roof a house or install a kitchen sink, you've got the skills to renovate a house. On the other hand, if you've got to pay a professional to do all of this work, the odds of making a profit on your investment will be dramatically reduced. To be successful, you need to be able to pick the right property, in the right location, at the right price for it's condition. HGTV has a fun show called Flip or Flop where two Realtors/renovators constantly watch the market for fixer-upper properties selling at prices well below "comparative home values" (or comps) for the neighborhood. Going in, they know what a home should sell for when they are done, what renovations make sen$e, and then deduct the renovation, holding, and selling costs to arrive at a potential profit. Invariably, the actual cost to renovate is twice the budget, which is why the starting price has to be low, and your skills and knowledge high. If a profit is doubtful or low for the time required from you, keep looking. Professionals take their time and wait for the right property at the right price. Novices rush out and hire the first contractor that makes a bid to address work they can't do themselves. Professionals either do the work themselves, or rely on a network of pre-arranged, reliable contractors. Novices fail to understand how to minimize their selling costs. Professionals rely on a blend of "for sale by owner" and Realtor efforts to minimize their costs and maximize profits. Novices expect to rush through the process, slap on a coat of paint and earn a fortune. Professionals understand that buying and selling houses takes time and that the profit margins are sometimes slim.